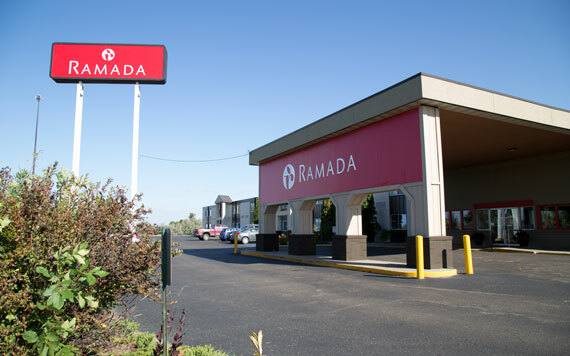 Our non-smoking Ramada Bismarck hotel is conveniently located at the intersection of Highway 83 N (State Street) and I-94, just minutes from the Bismarck Municipal Airport (BIS). We are close to the State Capitol Building, Bismarck Civic Center, University of Mary, and Bismarck State College. Each of our spacious guest rooms include a refrigerator, microwave, and free WiFi, or upgrade to a suite for added space. Other amenities include a free hot breakfast, fitness center, business center, room service, meeting and convention facilities, ample free outdoor parking, dry cleaning, heated indoor pool, sauna, and hot tub. Refuel at our Dakota Grill. Take advantage of our free airport shuttle service. Tour the North Dakota State Capitol Building, located just minutes from our Bismarck hotel, and while you are there, don’t miss the North Dakota Heritage Center, where you can explore North Dakota history from 500 million years ago through the present day.